A recent study, affiliated UNIST has introduced a novel technology that promises to significantly boost the performance of lithium metal batteries, a promising candidate for the next generation of rechargeable batteries. The study also validates the principle of enhanced battery performance via the real-time in situ observation of charge-discharge cycling. This breakthrough has been led by Professor Hyun-Wook Lee in the School of Energy and Chemical Engineering at UNIST in collaboration with the Agency for Science, Technology and Research (A*Star) in Singapore. Lithium metal batteries are a type of rechargeable battery that has lithium as an anode. Among a number of different cathode materials, lithium metal has the lowest driving voltage and boasts about 10 times more capacity than conventional graphite anodes. Therefore, it has been gaining much attention as a potential next generation anode material for electric vehicles and large scale energy storage systems. While lithium metal anode is an ideal candidate for high energy density batteries, fully using it as an anode in commercial cells is still remain elusive. For example, lithium metal tends to grow into dendritic structures during the continuous charging/discharging processes of a battery, which may result in poor performance. This is because this dendritic structure on the lithium metal surface layer triggers internal short circuits by piercing through the battery separator. In the study, the research team suppressed dendritic growth of lithium metal anode by coating the lithium foil with a lithium silicide (LixSi) layer. Results showed excellent electrochemical performances in terms of rate capability and cycle stability. In situ optical microscopic study was also carried out to monitor the electrochemical deposition of lithium on the LixSi?modified lithium electrodes and the bare lithium electrode. Conventional lithium metal anodes tend to form dendritic structures, which are known to trigger internal short circuits by piercing through the battery separator. 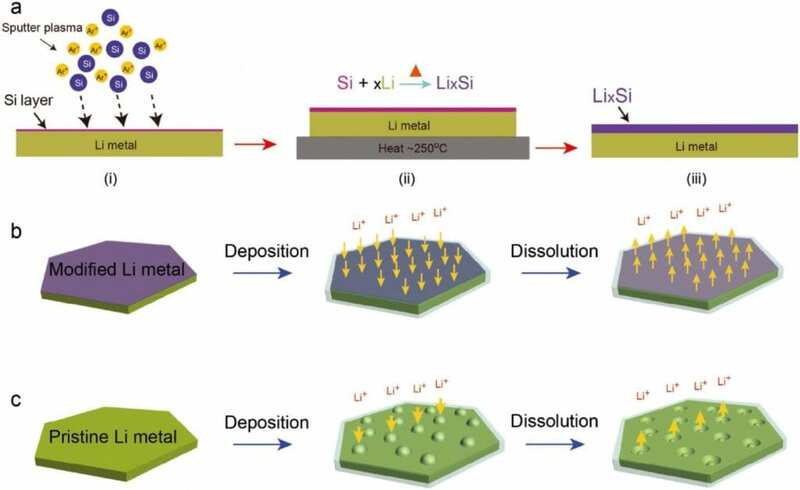 However, it is observed that a much more uniform lithium dissolution/deposition on the LixSi?modified lithium anode can be achieved as compared to the bare lithium electrode. "Our study provides the direct observation on the electrochemical behavior, volume expansion, as well as the lithium dendrite growth of lithium metal anodes," says Professor Lee. "Applying this in real battery will also help contribute to the commercialization of lithium metal batteries." This research has been supported by the Basic Science Research Program through the National Research Foundation of Korea funded by the Ministry of Education. Their findings have been published in Advanced Materials on July 6, 2018. Wei Tang et al., "Lithium Silicide Surface Enrichment: A Solution to Lithium Metal Battery", Advanced Materials (2018).